More hop than malt in balance. Long, long, long lasting ring lacing. 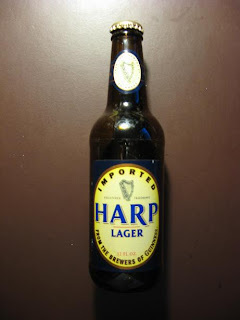 Guinness and Harp. Black and Tan. Half & half. This is 50% of that potent twin combo. On its own, Harp stands up with any other beer out there. Interestingly the product is now brewed on the other side of the pond in Canada; not Ireland. They are still true to the recipe. So strike up the band, pop the top and relax with one of finest imbibements known to mankind. Take it from one who knows, me, the reaper...this is the stuff angels drink! Surely it's "the craic!"